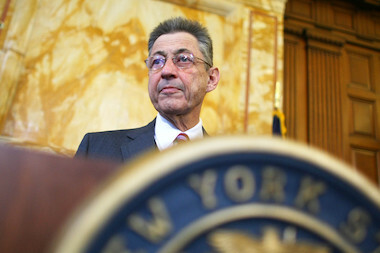 Sheldon Silver has stepped down as speaker of the New York State Assembly. NEW YORK CITY — Former Assembly Speaker Sheldon Silver could lose his apartment and pension if he's convicted of fraud charges in an extensive kickback and bribery scheme, prosecutors said in a stinging federal indictment. Silver, 70, was indicted on three charges, theft of honest services wire fraud and mail fraud and extortion in the alleged real estate and asbestos cancer schemes. But two conspiracy charges in the original complaint were dropped. Manhattan US Attorney Preet Bharara's office declined comment when asked why. “Our client is not guilty. We can now begin to fight for his total vindication. We will do our fighting where it should be done: in court," read a statement from Silver attorneys Joel Cohen and Steven Molo. Cohen declined further comment when asked whether the dropped conspiracy charges bolstered his client's claims of innocence. Silver was arrested Jan. 22 after a 35-page complaint accused him of being involved in a scheme that used his powers as an elected official to elicit millions "in bribes and kickbacks" that he masked as legitimate income. According to the complaint, Silver accepted nearly $4 million in bribes for more than a decade from referring asbestos lawsuits to personal injury firm Weitz & Luxenberg. Silver received $5.3 million from Weitz & Luxenberg, including $1.4 million as a salary for a no-show job and $3.9 million in referral fees for asbestos cases that he did not work on. He allegedly schemed with prominent Manhattan doctor Robert Taub to push patients to the firm in exchange for $500,000 in research money and other favors, such as a job for a relative at a non-profit where Silver had directed millions of dollars of taxpayer money. Silver also received another $700,000 in referral fees from a real estate law firm in an alleged kickback scheme as he directed tax breaks to two developers, including Glenwood Management, the largest political donor in the state. According to the indictment, Silver attempted to hide his fraudulent scheme by lying publicly about the nature of his work, claiming that none of his clients had business before the state when he was in fact successfully being lobbied on state real estate laws by Glenwood Management. Weitz & Luxenberg was unaware that Silver was directing taxpayer money to the doctor, according to the indictment. Glenwood Management was also unaware for most of the scheme that Silver was receiving payments from the law firm they retained to represent them on tax appeals based on Silver's recommendation. Asked last month why Glenwood continued to pay once it learned fees were being directed to Silver while they had business before the state in violation of ethics laws, the source said: "It was a business decision to continue to pay." Bharara said Silver, who is an attorney, did no work for any of the payments but told the public he consulted with clients. Silver had no experience in real estate law or asbestos litigation, two of the areas where he received referral fees from law firms. Silver also was not honest about the nature of the payments he received on required financial disclosure forms and hid the details of his arrangements from staff. The former speaker also prevented the disclosure of information about his outside income to the Moreland Commission to Investigate Public Corruption. Gov. Andrew Cuomo eventually disbanded the commission before its work was finished. Although Silver has said he would be "vindicated," he was forced to resign as speaker, a position he held for 21 years, after an effort to temporarily step back failed. Assembly members felt the looming charges and trial were too much of an impediment to handling major tasks such as the state budget. In addition to the loss of two apartments on Grand Street, his pension and monies earned in the alleged scheme, Silver faces 20 years in prison on each count. Silver has not resigned his seat representing the Lower East Side, even casting a vote for his replacement Carl Heastie of The Bronx.